This morning it's 31 degrees with some clouds and sun tickling the tops of the trees. The weather prognosticator is saying it should be warmer today with a twenty percent chance of thunder showers. It sounds like it's time to get the shorts out again. 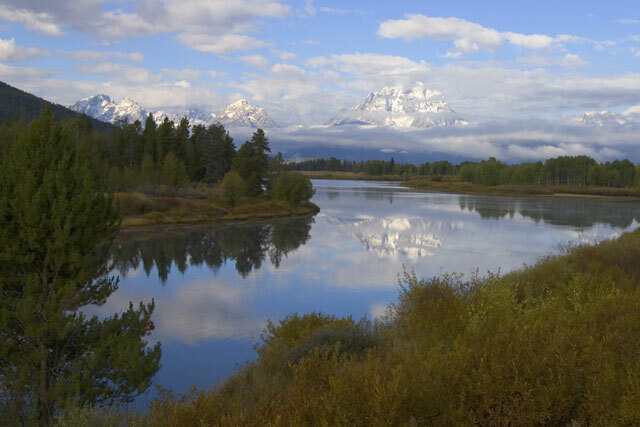 Today is Grand Teton day with a slow trip to Jackson, Wyoming planned. We took the main road south to Jackson stopping many times along the way to view the mountains and take pictures. They are truly spectacular and a sight to see. There were big puffy clouds hanging around them all day. Grand Teton, that tallest mountain had a cloud hat on all day. Next stop Jackson and hopes of a WiFi connection so we can get some emailing done. Jackson is a great old town with many historic old buildings including the Cowboy Bar. Ken was here as a small boy and remembers many of the old buildings. The city park is about one square block in the center of town. It has some great old trees but the neatest thing is the antler arches at each corner of the park. 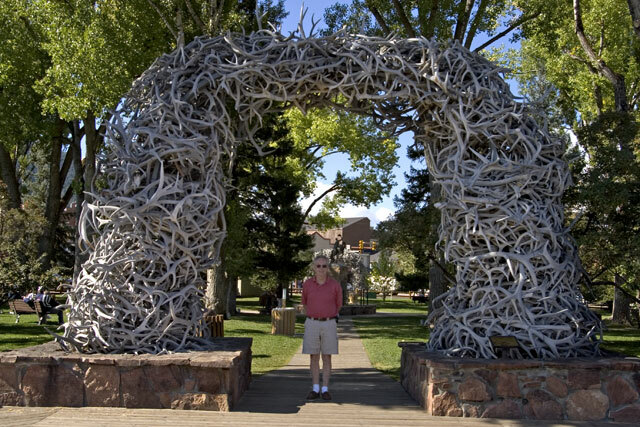 These big arches, around twenty feet tall and fifteen feet wide are made from stacked antlers. We don't know when they were made but Ken remembers them from the 1950's. We found lunch at the Bunnery Restaruant which we had to stand in line for. It wasn't that great but a person's got to eat. Next we walked the board sidewalks and checked out the shops. Driving around we were unable to find a WiFi point that worked. There were many WiFi sites they were either secure or just didn't work. We stopped for gas on our way out of town at a Phillips 66 station where the gas was ONLY $2.79. We did get lucky though and found a WiFi node that we could log on to. We downloaded and uploaded our email and then were on our way. A few miles out of town we came across the National Museum of Natural Art. It's a fantastic rock building with some very large sculptures both inside and outside the building. Inside there were galleries for small scale sculpture and art and a gallery for their major displays. They also had a nice gift shop where we bought an antler handled ice cream scoop, way cool! On the way back to Colter campground we took the scenic route which goes along Jenny Lake. 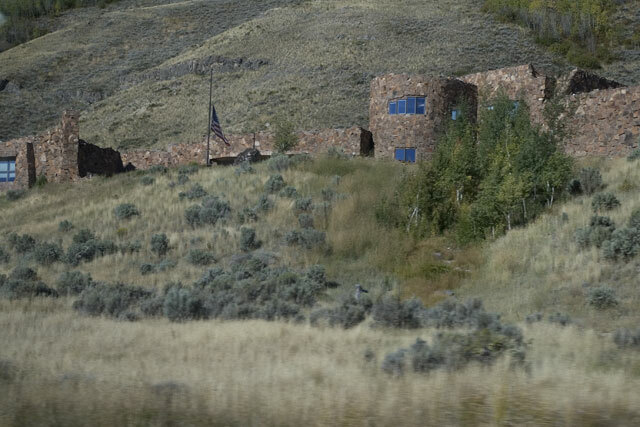 It is closer to the Teton's and gives you a different perspective. If you travel the area you should try to take both roads. They both have great views of the mountains. We needed some supplies so we stopped by the grocery store in Colter Village. We noticed that everything was posted 30% off. We asked the cashier if they were getting ready to close and he said next Sunday was going to be their last day for the season. I guess that's one of the problems with vacationing in the fall, things start to close up. Then it was back to the campground and another nice evening.